GREENSBORO — The poor economy played a role in veteran contractor John Kavanagh’s decision to close his namesake home-building firm, but it didn’t stop him from starting a new venture. 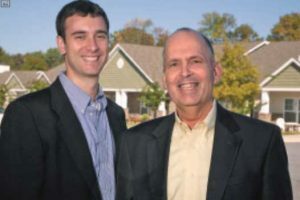 In early 2009, Kavanagh joined Lee McAllister and Mike Weaver in forming KMW Builders, a general contractor that has amassed millions of dollars’ worth of projects across the Carolinas. The company is poised for more growth with several projects in the pipeline, including a $6.5 million, 48-unit affordable apartment community in Greensboro called the Terrace at Rocky Knoll developed by Beacon Management. John Kavanagh, right, is president of of KMW Builders in Greensboro. Kevin Sasser is senior project manager. What does the company do? KMW Builders focuses on the affordable housing market as well as market-rate apartment projects and renovations. Most of the company’s work takes place outside of the Triad in areas as far as Summerville, S.C., where the company is planning a $16 million apartment development called Arbor Village. KMW Builders was also selected as the contractor for a $5 million, 66-unit senior apartment project in Concord that will begin in March. Though KMW never intended to be so geographically diverse, there were not enough business opportunities in the Triad to sustain the company, Kavanagh says. How did the company start? Before closing his homebuilding business, Kavanagh had a job lined up to build the 68-unit Churchview Farm senior housing apartment community but no longer had the financial wherewithal to execute the project. So Kavanagh pulled a small group of employees from his old company, including Kevin Sasser, and teamed with McAllister, who is the president and CEO of Weaver Investment Co., and Mike Weaver, chairman of Weaver Investment Co.
“It was Lee’s idea to start a company that would be a general contractor that would focus on affordable housing,” Kavanagh says. Biggest obstacle early on? Establishing KMW Builders as a player in the market. Sasser, the company’s senior project man-ager, says KMW Builders was able to over-come that obstacle with the completion of major projects including Carden Place, a 240-unit apartment development in Mebane, and The Arbors at Carolina Forest, a $12.6 million, 180-unit project in Jacksonville. On the rehab side, KMW showcased its renovation skills with a 100-unit apartment community in Fayetteville that is managed by Beacon Management. 650 units to date and expects that amount to grow by 15 percent, Kavanagh says. Biggest clients today? Brown Invest-ment Properties, Beacon Management, Durham attorney Sherrod Banks and the Weaver Investment Co.
Growth opportunities? Kavanagh says the company sees potential opportunities to build in both the Charleston, S.C., and Charlotte markets. KMW Builders could also potentially work on some select com-mercial projects “especially in this market where we have good contacts,” Kavanagh says. In terms of job growth, the company is planning to add an administrative person and likely another superintendent. How the company controls costs? Weaver Investment Co. provided funds for KMW Builders when the company was get-ting off the ground. “I couldn’t have started a business by my-self the way my credit was,” Kavanagh says. Weaver Investment Co. continues to back the company and provides back office sup-port including accounting and human re-sources functions.